Pictured L-R: Peter Chaikin, HARMAN® Professional; Carlo Libertini, Music Marketing; Rick Murphy, HARMAN Professional; Roshan Kindred, Iron Mountain Entertainment Services; Nathan Baglyos, HARMAN Professional; Raul Contreras, Native Instruments; Maureen Droney, Managing Director, Producers & Engineers Wing; Carmen Rizzo, Native Instruments; Johnny Rayborn, Music Marketing; Zoe Thrall, Director, Studio at The Palms. Photo Credit: The Recording Academy®/WireImage. © 2015. Pictured L-R: Gabriel Abaroa, President/CEO, The Latin Recording Academy®; Santiago Cruz, Latin GRAMMY®-nominated recording artist; Sebastian Krys, GRAMMY®- and Latin GRAMMY-winning Producer/Engineer; Maureen Droney, Managing Director, Producers & Engineers Wing. Photo Credit: The Recording Academy®/WireImage. © 2015. 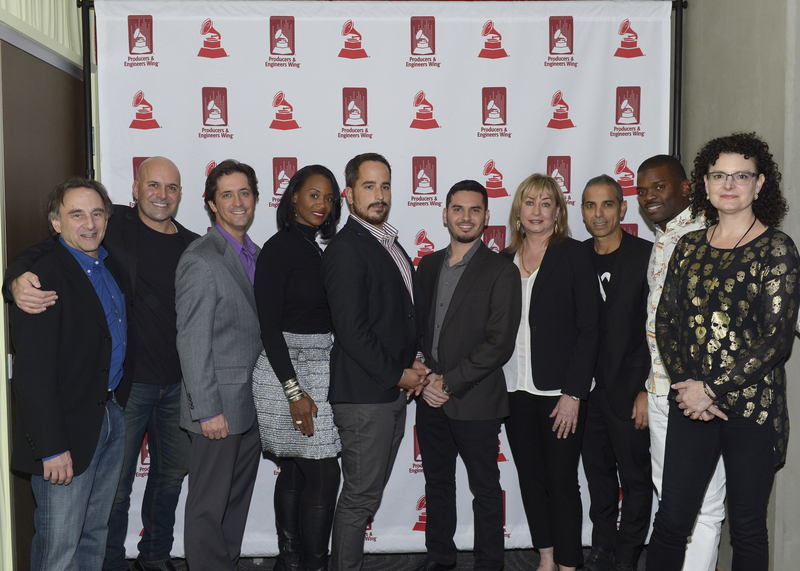 Santa Monica, Calif. (December 4, 2015) — The Recording Academy® Producers & Engineers Wing®, in partnership with The Latin Recording Academy®, kicked off Latin GRAMMY Week® in Las Vegas, with the third annual "En La Mezcla," a celebration of Latin recording professionals. The evening was hosted by multiple GRAMMY® and Latin GRAMMY award-winning producer and engineer Sebastian Krys. Over 200 recording professionals, Latin GRAMMY nominees and music industry executives gathered at Studio X, in the Palms Casino Resort, where DJ Mr. Pauer set the mood for the evening of music and fellowship. Latin Academy President and CEO Gabriel Abaroa and Producers and Engineers Wing Managing Director, Maureen Droney each took the stage to welcome guests. Abaroa emphasized the importance of the producing and engineering community and shared numerous achievements the Latin Recording Academy accomplished over the last year. Abaroa and Krys then introduced Santiago Cruz, the evening's special musical guest, who serenaded guests with emotional acoustic renditions of several of his popular songs. “En La Mezcla” featured some of the most prestigious audio-related brands who showed their latest products and interacted with guests. One of the highlights of the night featured a special presentation by a JBL professional that demonstrated the 7 Series line of studio monitors and debuted the new Sub18 subwoofer from the Studio X's control room. Other sponsors included AKG, DBX, FabFilter, HARMAN®, Iron Mountain Entertainment Services, Lexicon, Melodyne and Native Instruments. 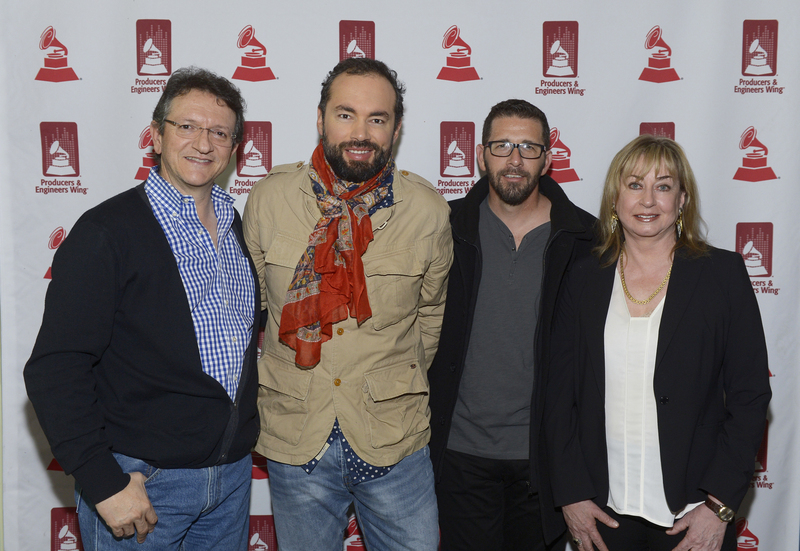 Photo Caption 2: Pictured L-R: Gabriel Abaroa, President/CEO, The Latin Recording Academy®; Santiago Cruz, Latin GRAMMY®-nominated recording artist; Sebastian Krys, GRAMMY®- and Latin GRAMMY-winning Producer/Engineer; Maureen Droney, Managing Director, Producers & Engineers Wing. Photo Credit: The Recording Academy®/WireImage. © 2015. About The Latin Recording Academy: The Latin Recording Academy is an international, membership-based organization comprised of Spanish- and Portuguese-speaking recording artists, musicians, songwriters, producers, and other creative and technical recording professionals. The organization is dedicated to improving the quality of life and cultural condition for Latin music and its makers. In addition to producing the Latin GRAMMY Awards to honor excellence in the recorded arts and sciences, The Latin Recording Academy provides educational and outreach programs for the Latin music community either directly or through its Latin GRAMMY Cultural Foundation®. For more information about The Latin Recording Academy, please visit LatinGRAMMY.com. For breaking news and exclusive content, follow us at: Twitter, Facebook, Instagram, Vine, Periscope, YouTube, Pinterest, Google+ and Tumblr.